Trippy poster art for Friday's Observatory show. 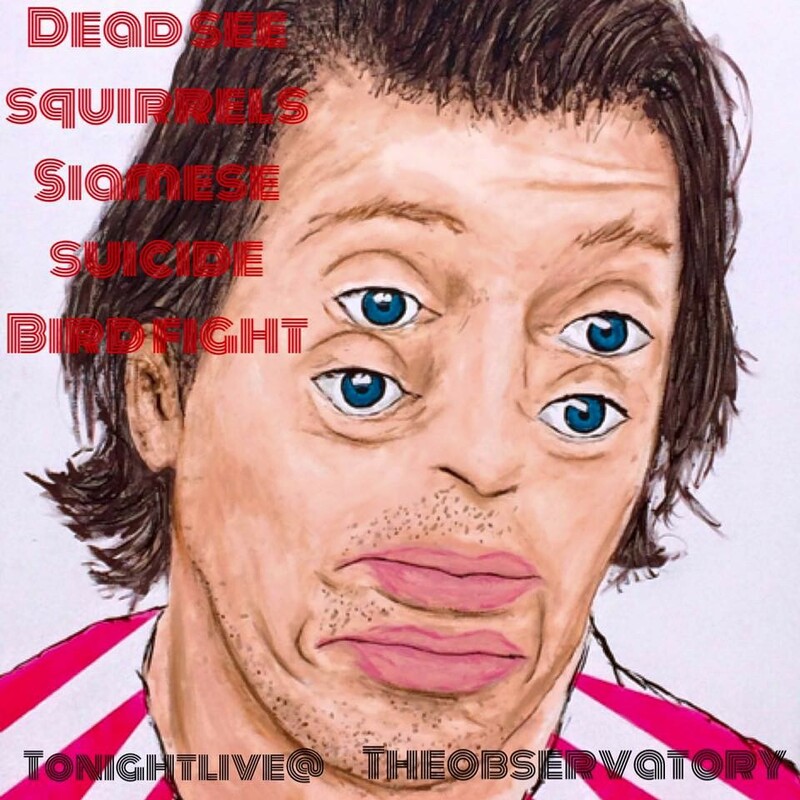 The Observatory is getting into that good weird rock tonight with Dead See Squirrels, Siamese Suicide and Bird Fight. The show starts at 9:30 pm with a $5 suggested donation. If you still haven’t checked out one of the newest music venues in town, tonight is the night. KYRS is at it again with another concert fundraiser (they’ve opted to do a lot more small shows, rather than one big one Marmot Fest), featuring Mama Doll, Casey Dubie and Water Monster. For fans of folk, folk-pop and electronic-pop, this show offers some of the most polished local acts around. Touring Christian music show Rock and Worship Roadshow is back at the Spokane Arena tonight. Truly a family-friendly event, the show features big names like Newsboys and Jeremy Camp as well as Family Force 5 and Audio Adrenaline. Anyone who was majorly into Christian music in the '90s will be flooded back with memories during this performance. Show is $10 at 7 pm. I shouldn’t even be talking about this. I’d like to keep it all to myself, but the SPR Recordings & Videos sale starts Saturday at 9 am at the Lincoln Center and runs through Sunday. The earlier you arrive, the better vinyl you may be able to find. The United Kingdom is nowhere near New Orleans. Yet while growing up in Wales, New Mastersounds guitarist Eddie Roberts was continually drawn to the jazz and funk music coming out of the Big Easy. Forming his band in Leeds, England, in the late ’90s, that exploration of soulful grooves continues to this day. This Saturday — as one of the Sandpoint Winter Carnival’s final events — the four-piece provides the perfect, mostly instrumental soundtrack for those looking to let loose and feel at one with the earth. Expect a lot of tunes off New Mastersounds’ sprawling October release Made For Pleasure, which includes a cover of Iggy Azalea’s “Fancy” and, unsurprisingly, was recorded in New Orleans. Show starts at 9 pm and is $15. The Dancing Plague of 1518 (an actual plague that swept France) is releasing its debut EP (on tape) Saturday at the Baby Bar. The new electronic act is a solo project for Sea Giant’s Conor Knowles. Sea Giant and Paisley Devil open the show that starts at 9 pm and is free. &amp;amp;amp;lt;a href="http://dancingplaguemusic.bandcamp.com/album/modern-sleep"&amp;amp;amp;gt;Modern Sleep by The Dancing Plague of 1518&amp;amp;amp;lt;/a&amp;amp;amp;gt; Class act Tyga, yes, the dude who decided that Beck, Taylor Hawkins from the Foo Fighters and Paul McCartney weren’t cool enough to get into his Grammy after-party, is hitting up the Knitting Factory tonight. Openers include Bonaphied, Lee Haze and Bezzel. Tickets are $40 and the show starts at 8 pm. Some people are probably excited about this one. Matisyahu, in all of his former-Hassidic Jew-turned-reggae artist glory, is coming to the Knitting Factory just over a year after his last appearance. This time it's all about the Live at Stubbs Vol. 3 album. The show is $28 and starts at 7:30 pm.